Buckeyes bring some thunder of their own to top the Thundering Herd in Wednesday’s game at Bill Davis Stadium. 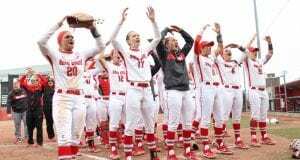 Ohio State broke their two-game losing streak and beat Marshall 7-4 by pilling on runs early. The clear skies proved to be a good omen as Zach Hurley and Cory Kovanda started the bottom of the first with back-to-back doubles and later scored on a ground out by Michael Stephens and a single by Ryan Dew, respectively. Cory Rupert kept the hitting going with an infield single and Brian DeLucia finished off the first-inning barrage with a three-run homerun as the Buckeyes batted through the lineup and scored five runs in the first. That was enough run support starting pitcher Brett McKinney needed to record the win as he pitched five no-hit innings before handing off the pitching duties to Theron Minium. McKinney entered the game on a strict pitch count while recovering from soreness in his throwing shoulder, Coach Bob Todd said. There was no evidence of soreness Wednesday. “Today was one of those days I kind of had everything working … fastball, slider, change-up,” McKinney said. The Buckeyes added two insurance runs off two wild pitches in the seventh inning. The wild pitching continued as Marshall got on the scoreboard when Jared Strayer let one get away. The Thundering Herd made things interesting adding three runs in the ninth and bringing the tying run to the plate before surrendering the victory to the Buckeyes. The win allowed Ohio State to avenge a 17-1 loss to Marshall earlier this season as well as a 14-3 loss the team suffered at home to the Herd in 2009. “I was anxious to get out and … help the team turn around and shift the way we’ve been playing,” McKinney said. The victory allows the Buckeyes to enter an important weekend series with Michigan with a win under their belt. 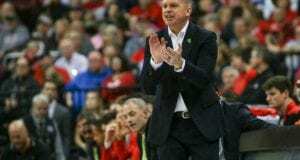 The Wolverines and Buckeyes are two of four teams tied atop the Big Ten Standings. The teams square off at 6:35 p.m. Friday in Ann Arbor.